Pray for Healthy Marriages, Vibrant Singles, and the Priesthood & Religious Life. Healthy marriages need both a nurturing environment to discern their commitment and the support of the community after they have made their vows; vibrant singles need both the wisdom of family and friends to discern their gifts and the participation of the Church to call forth those gifts in service to others; priests and religious need both the input of their fellow Christians to discern a life of service to the Church and the prayers and support of the people of God to live faithfully their calling. 1. Contact Linda Merle or by phone at 918-664-2253. You will be added to the roster of names, for alphabetical rotation. 2. The ministers schedule can be viewed or downloaded from the home page. Hard copies are available in the vestibule the first of each month. 3. The Vocations Crucifixes are located on the altar shelf adjacent to the baptismal font in the vestibule. 4. Pick up the Crucifix after Mass. Each Crucifix is labeled on the back with your specific Mass time. The Prayer Booklet “Devotional Prayers and Prayers for Vocations” is yours to keep. 5. 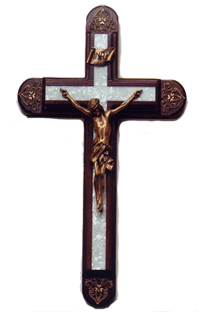 Place the Crucifix in a prominent place in your home and pray for Vocations daily. 6. Return the Crucifix the following week to the altar shelf before Mass.